This entry was posted in Personal, Star Wars/Stormtrooper. Bookmark the permalink. Nice display there Gordon. And I see what you did thar! Lol now for someone to get that 1K+ SGD Judge mask from FF12. Nice room Gordon. And of course, Hail to the Empire! And I would very much love to get both, but currently my bank balance is a single digit, thanks to Ninja Gaiden 2, bloody preorder sold it for me. T_T. I should have enough time to get my funds up for Lazengann, of that, yes, but Gurren Lagann may have to wait just a bit, A BIT. And I can already imagine them locking fists like in TTGL S2’s OP. SO EPIC. Btw. Gordon, nice desktop management! It’s quite neat and the figures are displayed nicely. Are you working on assembling a full suit? Cool display you’ve got there Gordon.. Iwish I have that in my room.. I think I got one of those too. From one of those cereal box promos where you cut out 10 bar codes and mail in for it. very nice collection you have. I still want that Yuki by Max Factory; it is very hard to find now. Also nice space, I wish I had the same space as yours. it’s a dell widescreen 20″. not sure about the model. oh yes i will definitely love to. that is if it aren’t too expensive and preferably brand new. i might need to modify the helmet. i can’t wear my glasses in them. maybe gonna put my lens in there. thanks. i like my desk neat and tidy. really? u can get one from cereal box promo? is it a lucky draw? if yes i guess not everyone is lucky. oh noo!! Another one has fallen! Sooner or later we’ll have massive numbers of stormtroopers under Danny’s command! Danny’s Stormies, eh Lol ^^…And I’m going to follow other in saying how neat your desk is. ya i know. but come to think of it, wearing armour will be hell with singapore’s weather. u mean u don’t have one of those cheap and good detolf cabinet? ikea was selling them at half price not long ago. actually that aren’t my desk. that’s my computer desk, my own desk is full of stuffs like gundams and mangas. CLean & neat, this is what I wanted my desk like. Too bad don’t have time to clean up the mess I did. That Destiny EBM’s wing not interupt meh put there..? destiny is fine on the desk. its wings are too large I can’t put it inside the cabinet or shelves. 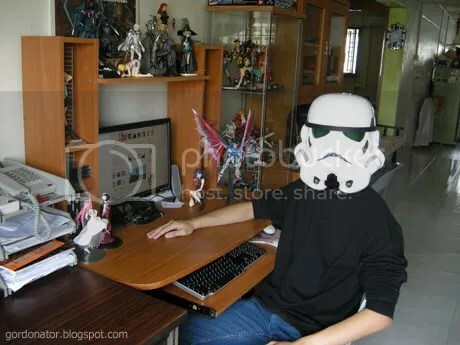 Wait, I think it was a clone trooper helmet for promotion of ep.2 maybe. Either way, it was 2 pieces of cheap plastic molded together. haha. Looking forward to a caramelldasen in Orchard road in your trooper armour. Love the helmet – where you get it? got it from a local toy store who import it from the US. its made by master replicas based on Star Wars: A New hope.